More passive aggressive anti-Trump nonsense from the Left. The much-celebrated arrival of Barack Obama caused Leftists to ooze with pride. They promptly hung pictures of Obama up in every federal building in the country. Schools did more than that, as they established virtual shrines in his honor. Yet things are very different for America’s first billionaire president. SUBURBAN WEST PALM BEACH (CBS12) — A presidential picture at the West Palm Beach VA Medical Center is M.I.A. 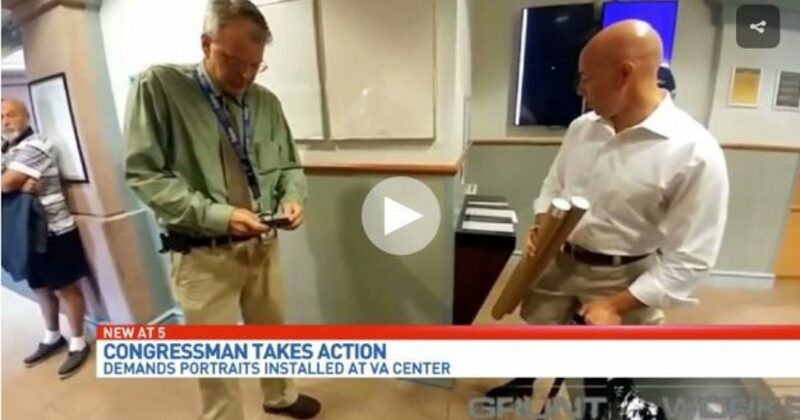 Local veterans turned to a Florida congressman to get the picture hung Tuesday, but as it turns out it didn’t stay up very long. Some veterans feel they’ve fought for their country. They feel they shouldn’t have to fight the VA over something like this. For veterans like Walter Korabiak, a Vietnam vet from South Florida, the matter seems simple. President Donald Trump’s photo deserves to be in the lobby of the VA Medical Center. “It should be there. Every other president was there wasn’t it? Something’s wrong,” Korabiak said. Nearly two months into Trump’s presidency, some local vets are growing tired of looking at empty walls so they turned to fellow veteran and Congressman Brian Mast. The Congressman brought in a picture of President Trump and the new VA Secretary and put them up this afternoon. “There was nothing on the wall and it was disrespectful to a lot of veterans. Proud of the fact the local vet community got it done. Walked in there, we made it happen,” said Beau Brumfield, a veteran who helped get the photos displayed. As the story explains, their accomplishment didn’t last long. Within hours, management at the VA took down the pictures. The reason? Management says they could not authenticate the photos and they have to follow protocol. “You do what you’re supposed to do and do what you gotta do. If they’re a bunch of bums, get rid of them. You can put that on TV,” said Joseph Nappi, a veteran from Boynton Beach. A VA spokeswoman says they’re trying to get official portraits that can be displayed on the wall. Especially after so many veterans contacted me about this issue, it is disappointing to see resistance from the VA overhanging the portrait of both the Commander in Chief as well as the Secretary of the VA.
It’s been long enough. President Trump’s pictures should have been hung in every federal building on DAY ONE!